Who this headphone benefits?/Who they do not benefit? impedance: 64 Ohm. What is Headphone Impedance? frequency response: 8 – 25,000 Hz. I’m gonna be honest with you right now in my Sennheiser HD 280 pro professional headphone review. Transparently honest. These are a good set of cans. Exceptional even. Flat and neutral sounding. Great for mixing. Clear. crisp, precise, etc. etc. They aren’t very exciting. If you’re looking for an affordable pair of headphones for mixing in studio, then these may fit the bill. But be sure to check out my other posts on the matter at hand. For casual listening they are good, but won’t really provide you with that “Wow” factor. The sound is very flat and even across the spectrum. They are crisp and pleasant, but not very loud. They are simply some of the most accurate cans around for the price. However, they don’t make me want to shout out from the mountain tops or anything. Lol. This just may be the smartest purchase you will ever make. I had done quite a bit of research on them for a few of my other articles, and I have found after wearing these for a few weeks that the consensus is accurate. The 280’s are rock solid and durable, and withstand a ton of abuse. There are reviewers on amazon that have owned these for upwards of 5-10 years.. some of which came back for a glowing update! The comfort level is definitely above average. Clamp force is a bit tight, but opens up the longer you wear them. The material that the ear cups are made of feels very nice and soft, and doesn’t seem like it would break down over time. The headphones are quite bulky, but do not feel heavy on my head. Overall I am satisfied. They are similar to the Audio Technica ATH M50 in terms of comfort level, although these clamp tighter and are a bit heavier. I could probably toss these around and they would still be okay. I’m not going to, but build wise they are some of the toughest headphones I’ve owned. As mentioned above they are quite bulky, which sort of explains their rugged nature. They are comprised almost entirely of plastic, but it’s a thick plastic that has some meat on it’s bones :P. They definitely feel like a solid set of headphones when you’re holding them. They also fold and contort in a myriad of ways for added durability, and prove to be very versatile in this regard. Ever slept on a pair of headphones and cracked them because they lacked that range of motion? Not so with these. If you’re only going to use these primarily in studio, then they are an excellent buy. If what you’re looking for is mobility, then look elsewhere. Again, they are big and bulky, and actually look kind of ridiculous and quite nerdy in the mirror. I may have considered taking them out, if not for the coiled chord. It becomes a huge inconvenience, and to be quite honest I haven’t ever worn these outside of my home, though you may. If you do, be prepared for people to look at you like you got a flower pot head kid. Lol that was taken directly from a Wu-Tang intro. Perhaps the most important and strongest aspect of these is the sound they produce. It’s very pleasant and neutral. It’s not overpowering, and the bass isn’t muddy or boomy. Be aware that these are about as flat and neutral as it gets. You’re not going to be floored or amazed when you put them on, so just a forewarning. Expect an honest representation of what you’re listening to. They aren’t very loud either, but get the job done and are a nice go to option for your affordable mixing needs. The low end is lacking a bit however. Even for neutral cans, I feel like there could have been a slightly beefier bass presentation. At times the music feels a little hollow. A bright treble and mid range ends up compensating for a lack of bass. Flat, even sound across the spectrum. Very neutral. Durable and strong like ox. Longevity through the roof . Not particularly exciting or mind blowing. Bulky, not great for portable use. Headband sometimes prone to cracks and breakage. These were isolated cases. At 64 Ohms, you will not need an amp to drive these puppies 😛 How to choose a Headphone Amp! Beat makers and producers on a budget, looking for an honest and accurate mix. People who value a neutral representation. People looking for a pleasant overall sound at a great value. People who like a crispy sound signature, with more emphasis placed on the high end/treble range. Who they do not benefit? People looking for a heavy bass response. People who are looking for portability/mobility. These aren’t made for that so be weary. Regardless, this is a great higher end entry level set that should definitely be considered if you are just getting into the world of audiophiles. Well that’s about it for today my friend! I hope you enjoyed my Sennheiser HD 280 pro professional headphone review! Questions? Comments? Requests? Did I miss the mark on something? Leave a comment down below or Contact me!! What do you think about these? What are your favorite headphones? Let me know!! If you have any further specific questions about these, I would be more than glad to answer them as well! I very much look forward to hearing from you..
Sony MDR V6 Review | Could’ve had a V6! Long time no see. 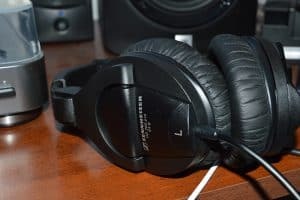 Every now and then, I’ll come across the article summarizing your review and thoughts on the Sennheiser HD 280 Pro, which is a well thought out and articulate review by the way. Although I have more reverence and general usage regarding the Sony MDR V6/7506, the 280 pro have not gone by the wayside personally speaking. I’ve both previously and currently own a pair of the 280’s. They are a very competent headphone though it’s somewhat funny seeing a rather uncolored sounding headphone sell for less compared to say an M50x or DT770. From my experience, the Sennheiser’s stack up interesting with either the V6 and 7506. While I like how the bass on the 280’s are not muddy in addition to being neutral, there are times where it’s somewhat lacking. On a sliding scale between these and the V6/7506, these may be more realistic though the V6 hits the sweet spot between being pretty neutral and not really lacking either. The 7506’s bass is very clean though slightly hyped vs the V6 and 280. The mid-range on the Sennheiser’s is quite flat and balanced. Though, I felt there was slight clutter to vocals and instruments vs either of the Sonys. That being said, the overall body of the mids remained more preferable to the 7506 for instance. Treble on the 280’s are intriguing. They sound more realistic and extended when stacked up to the V6 and 7506. Though, there is a relative lack of excitement regarding sound signature compared to either pair of Sonys. From my perspective, the Sennheiser’s are smoother and less fatiguing than the 7506 certainly. While very precise, the 280’s don’t sound quite as knife-edge like vs the 7506 or V6. This can be both good or bad depending on perspective and application. Lastly, it would be interesting to see a comparison review between the 280’s and/0r V6/7506. Anyway, keep up the good work as always Stu. Sorry for the late reply. A lot going on lately! Thank you so much for the kind words. I agree with all of your sentiment on these headphones. Your impressions line up with mine and thought it was an excellent write up. You’re right about the 280; it can be rather dull sounding at times and I think for me it boils down to 2 things. One is the treble like you mentioned. It’s not bad. It’s actually good and comes across in a very organic and natural way. But it sometimes lacks a bit of zest and energy. The second is the mid-bass. Looking at Ty’lls graph of the 280 makes perfect sense when I think back on my time with these headphones. I owned them at one point and gave them away. I just got super bored with them but we should also keep in mind I had them in 2015 or thereabouts when I was still kind of a bass head. I think now I’d appreciate them a lot more since I value mid-range clarity more than bass slam. I wish I had NOT gave them away because I’d have more headphones in my collection now to demo and do videos on. A couple of others I gave away were the HD201 and HD202. You’re right about the V6 and 7506’s treble. For me it’s mostly good; I enjoy that extra sparkle although at times it can get a bit hot. Still, the V6 is probably the best overall headphone I’ve ever heard for the money or otherwise. Like you said, it strikes that perfect balance between being great for reference but also as a casual listener as well. My friend Brennan Parker from YT always thanks me for that recommendation because he says the same thing: It’s a great headphone just to kick back with even though some other people online might tell you otherwise. He swears by it in fact, that to this day he’s heard a lot of headphones but nothing really makes him want to upgrade from the tried and true V6. Out of all of my current crop, the V6 is one that’s staying. I would love to get my hands on a 280 again. I think it would be a great candidate for some Shootout/Comparison videos. Have you subbed my YT? I have some good stuff on there you may like as well! Anyways, thanks for stopping by man! Hit me back up soon.